SCVHistory.com LW2079 | Film-Arts | Outlaw Trail, Monogram 1944. Arguably the biggest name in this picture had one of its smallest roles. 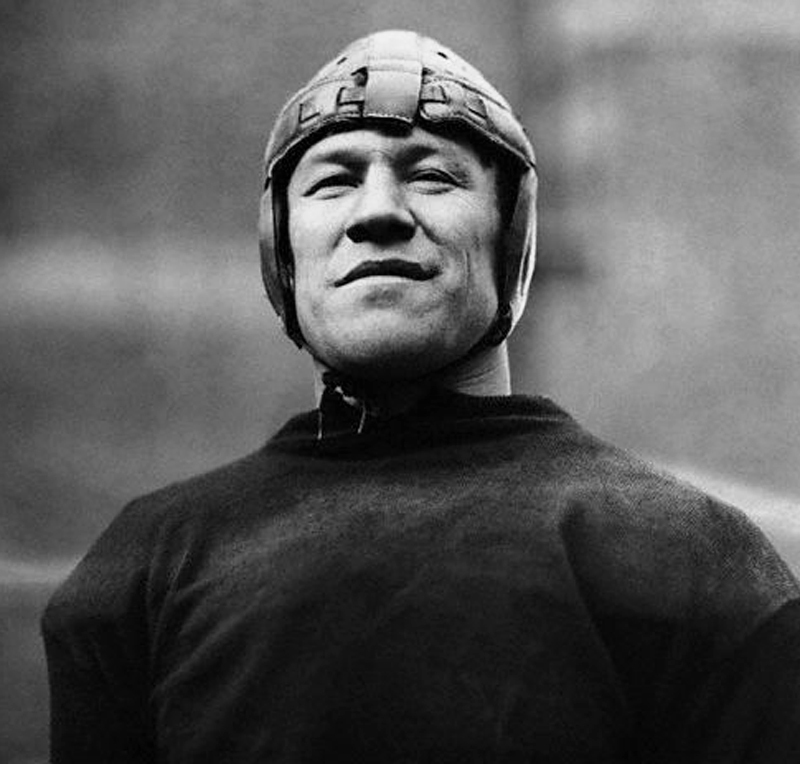 Jim Thorpe (1888-1953) — the same Jim Thorpe who won Olympic gold in the 1912 pentathlon and decathlon, and went on to become "America's greatest athlete" on both the gridiron and the baseball diamond (as well as the basketball court) — played a henchman in this nondescript 1944 Monogram buddy picture. Thorpe made numerous appearances in B-Westerns that were filmed in Placerita Canyon in the 1940s. Of mixed Sac and Fox, Potawatomi and European ancestry, he often portrayed an Indian in Westerns — but not always. His first screen credit dates to 1931 and his last to 1950, three years before his death. Burt Lancaster played him the 1951 movie, "Jim Thorpe - All-American." 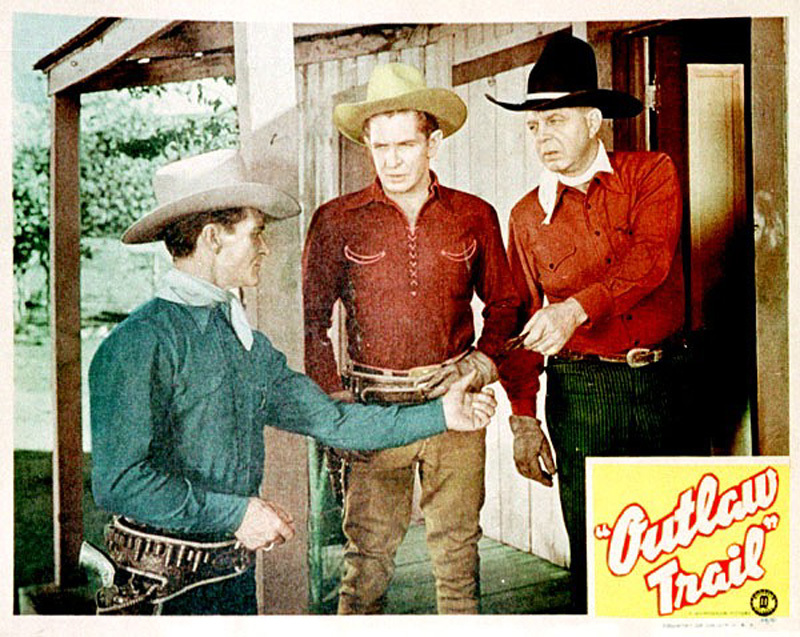 (From left) Gene Alsace, Bob Steele and Hoot Gibson are cleaning up the "Outlaw Trail" in this 1944 Monogram picture, filmed in the Western town at the Monogram movie ranch in Placerita Canyon. In 1952 the ranch and town were purchased by Gene Autry and renamed "Melody Ranch." Released April 29, 1944, "Outlaw Trail" was a 53-minute, black-and-white Western directed by Robert Emmett Tansey and written by Alan James and Frances Kavanaugh. The cast included Gibson, Steele, Chief Thundercloud, Alsace, Jennifer Holt, Cy Kendall, George Eldredge, Warner P. Richmond, Charles King, Bud Osborne, Jim Thorpe, John Bridges, Hal Price, Charles Murray Jr., Frank Ellis, Al Ferguson and Tex Palmer. The plot, per IMDB: "Carl Beldon (Eldredge) has disappeared and the Trail Blazers have been sent to investigate. Arriving in town, they find that 'Honest John' (Kendall) controls everything. He even prints his own money. He also has a gang and they set out to finish off the heroes."